Technology is evolving in giant leaps, and as a result the digital artist has constantly to keep an eye on how to incorporate the new achievements into his/her work. As of the writing of this Manual, portable tablet computers, such as Apple’s iPad, are coming into common use in field archaeology. Although they are fairly powerful devices and widely used for in situ data processing, they haven’t quite reached the level of accuracy needed for epigraphic documentation. If the artist wants to draw digitally on site at the monument, he/she needs to have a portable yet powerful device with large graphic memory, a very high-resolution screen with minimal glare, and a very accurate digital stylus. Until now this setup could be achieved only in the studio, by using the equipment explained in this Manual. The method described in the past chapters is a hybrid. 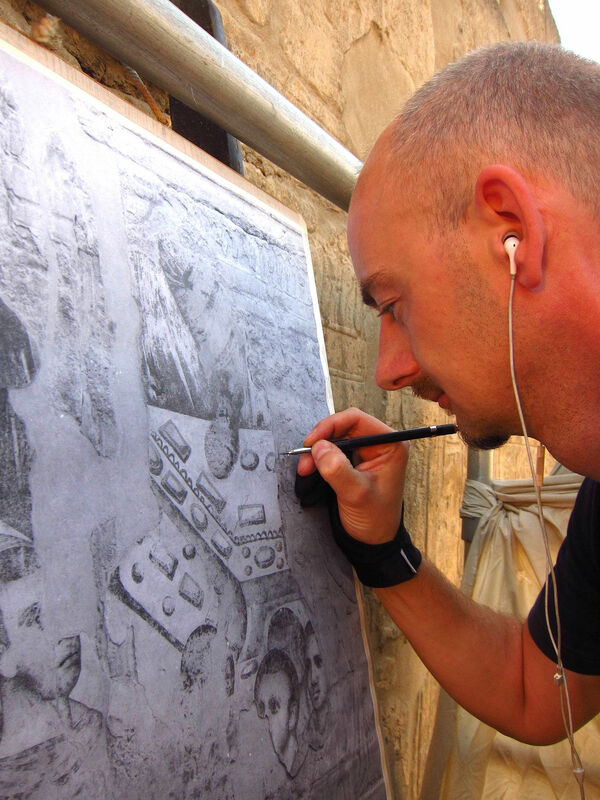 Although the final version of the Epigraphic Survey’s documentation process can now be done digitally, the initial documentation is still made by freehand on traditional media (i.e., a printed photographic enlargement). This means that the artist has to go to the wall, create the initial copy (done manually), scan it, ink it (done digitally), print different versions at certain stages for collation (done manually), and finally re-enter the modified data (done digitally). When the epigraphic method used by the Epigraphic Survey was invented, it was created in a way that would keep data loss at a minimum during the entire documentation process, and this is why digital epigraphy has to move in the same direction. Until that happens, there are still plenty of different directions that can be explored. Some of the new digital projects carried out by the Epigraphic Survey take digital documentation even a step further. One of these approaches concentrates on the enhancements that can be applied to already existing drawings, while the other one extends the layer system to the extreme when dealing with complex decorative programs. But it is important to emphasize that both of the following methods are based on the artist’s close observations made at the wall while drawing a carefully executed initial version of the decoration. 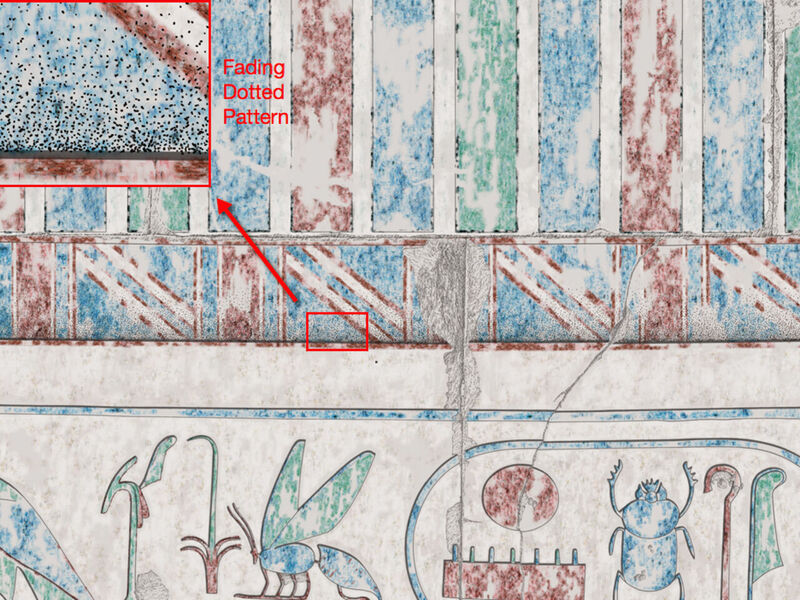 This project is a Digital Color Pencil enhancement based on the scene numbered MHB 118, which shows multiple layers of carved and painted decoration from various historical phases. The original drawing was created on paper using the traditional Chicago House Method. At a later stage, it was set up as the background for a color study of its Ptolemaic layer’s painted details. This enhanced color pencil drawing was drawn on mylar (matte acetate paper) and - after scanning - was set up as a layer over the traditional black-and-white line drawing. MHB 118 is one of the central scenes at the Medinet Habu Small Amun Temple façade, and therefore it’s one of the best candidates for demonstrating how the temple looked in all its polychrome glory in Ptolemaic times. Once the existing façade section drawings (MHB 207 NL, MHB 207 NR, MHB 118, MHB 210/211 L and MHB 210/211 R) were scanned and pasted together in Photoshop, they had to be aligned with the façade photo and the color pencil drawing made of MHB 118. Since the top and the bottom of the façade (i.e., the cavetto cornice and the base of the wall) weren’t formally drawn, these architectural elements were added digitally and inked in Photoshop. 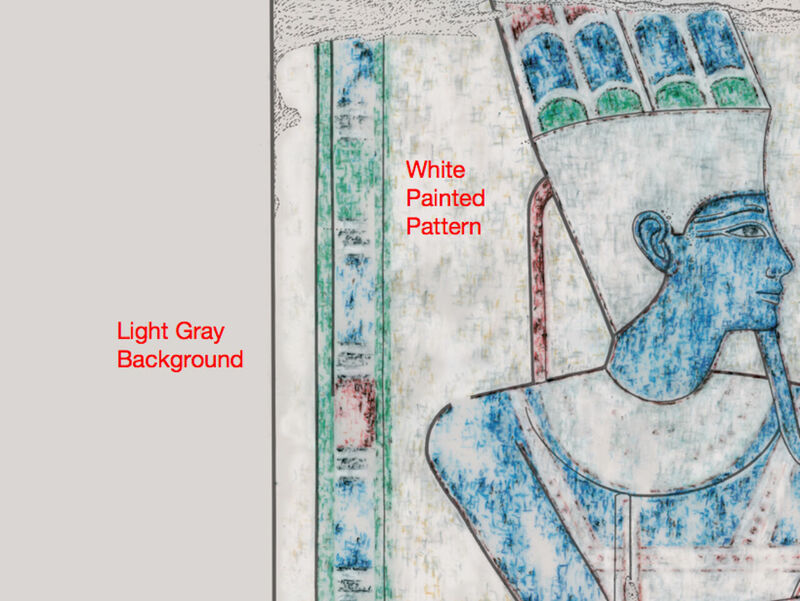 When the composite drawing was ready to be colored, color patterns had to be made, based on the actual color pencil texture used on MHB 118. 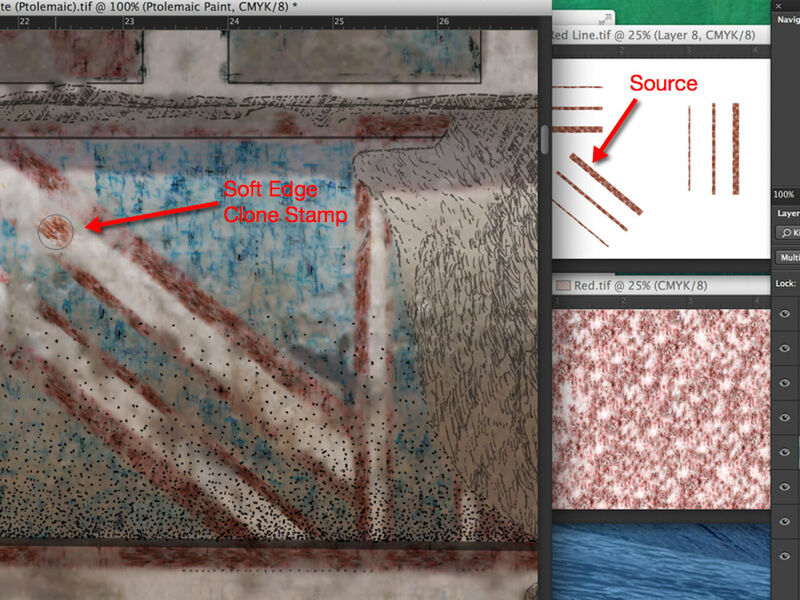 These textures were the result of cloning more intense and less intense color areas into a rectangular pattern. 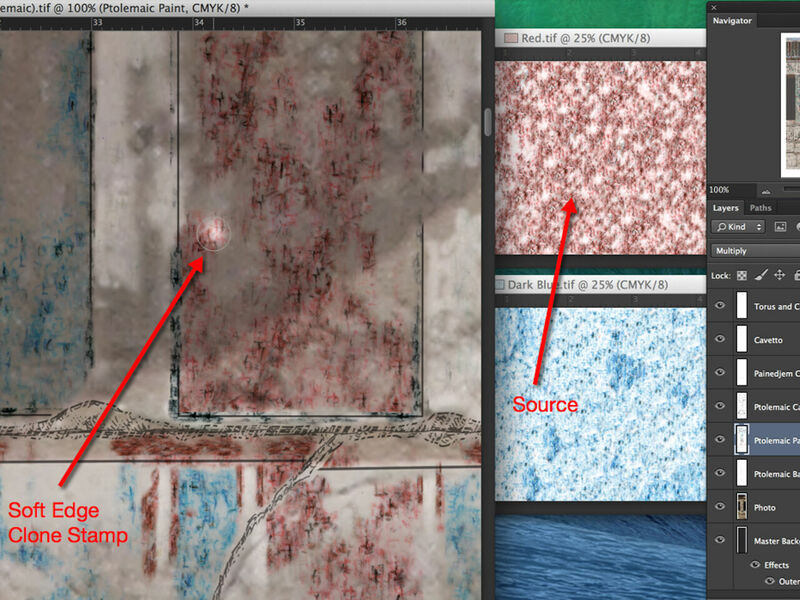 Each color panel was saved as a tiff and used later on as a sample for adding colors to the scene. Particular difficulties arose when outlines needed to be added. Some of the simpler outlines, such as straight lines, were created digitally and used the same way as the rectangular color patterns. 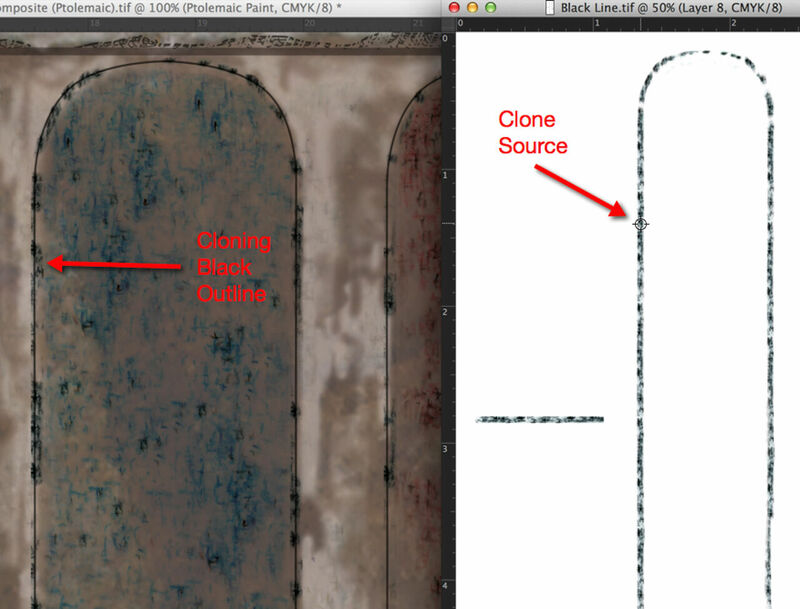 The Clone Brush needed to be set very soft to get the necessary blending effect when applied. More difficult outlines, such as the cavetto cornice details, had to be drawn on mylar first, than scanned and used as a clone pattern for each detail. Of course, all of these details were carefully studied at the temple and marked on the photo for reference. Once all the color details were added to the surface it needed to get the same slightly worn paint texture that made MHB 118 distinctive. (The reason for applying worn paint texture on MHB 118 was to avoid adding dubious details over faded or damaged areas.) 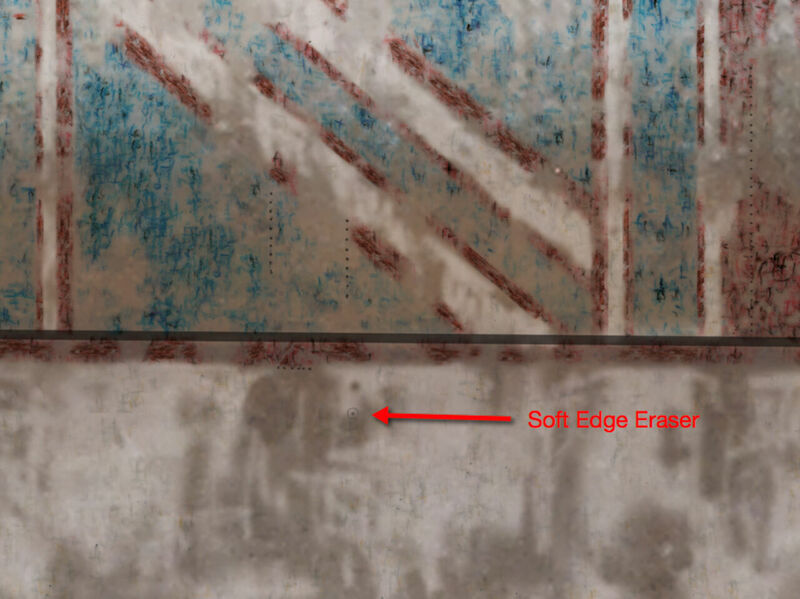 Some of the paint needed to be deleted by using the soft edge eraser in different sizes. When all the paint-related additions were applied, and the photographic background was turned off, certain architectural features (the cavetto cornice and the torus) lost their three-dimensional appearance. Therefore, additional stripes of fading dotted pattern were added to the drawing over the top of the cavetto cornice and the bottom of the torus, emphasizing these projecting architectural elements. Finally, the drawing’s background needed to be changed to light gray to prevent the white brush strokes from disappearing. An effect (fx) was applied over this background (Outer Glow) for a more natural interaction with the transparent paint layers. The blend mode of the whitewash paint layer (the painted background on the façade) was changed to Pin Light, which gave a more moderate brightness to the white texture.